Celebrity endorsements are a cornerstone of advertising nowadays, but an industrial manufacturing giant like Boeing seldom gets the chance to play that game. What celebrity is going to tout stuff like cargo hold capacity and cruising range? Well, Boeing's chance came several weeks ago, when one of its 747-400 jumbo jets touched down at the company's manufacturing plant in Everett, Wash., with Captain Bruce Dickinson at the controls. Dickinson is better known as the frontman for Iron Maiden, the British heavy-metal band that's sold over 90 million records in a career spanning four decades. The 57-year-old Dickinson's talent for soaring applies to more than his voice: Since the 1990s, he's also held a commercial pilot's license. Iron Maiden is currently in the middle of a six-continent, 35-city tour in a chartered 747. And Dickinson is doing all the flying. "When Iron Maiden announced they were using a 747 for their world tour, we knew we wanted to work with them to 'bring the plane home'—to Boeing, where it was built," Boeing spokesperson Mary K. Kelly told Adweek. Fortunately, the band was actually in the neighborhood, leaving a date at Vancouver's Rogers Arena and heading for a show at the Tacoma Dome. After the jet (dubbed "Ed Force One," a dual riff on Air Force One, the presidential plane, and Eddie, the band's skeletal mascot) pulled in, Dickinson took a tour of Boeing's 472 million-square-foot factory. He also met some of the 3,000 employees who turned out for the occasion. "We wanted to highlight another use for the 747 outside of traditional commercial transport," Kelly said. 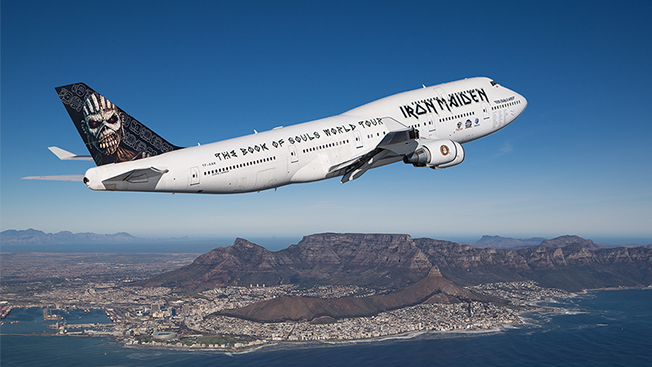 "Iron Maiden has a beautiful and unusual livery—the plane draws a lot of attention at every airport where it lands. In addition, Iron Maiden is leveraging the unique characteristics of the airplane, range and cargo capacity, for their world tour and we wanted to highlight the Boeing engineered features in an interesting way." Thanks to the ubiquity of smartphone cameras, the attention generated by Iron Maiden's plane has gone far beyond the airports where it lands. A popular recent photo on Reddit's front page showed how Ed Force One dwarfed the planes used by Germany's chancellor and the president of France. This week, another photo hit the front page of Reddit, showing Iron Maiden "refueling" in Munich with a few crates of beer. And while Boeing hasn't hired Dickinson as a spokesperson, it could hardly hope for a better one. His maniacal on-stage persona notwithstanding, Dickinson is an surprisingly articulate, humorous man—and an enthusiastic proponent of Boeing's products. "Honestly, it's such a beautiful airplane," the vocalist says in the video. "This machine enables us to do a European itinerary on an intercontinental basis. So, it's our time machine. It's our magic carpet." Not incidentally, Iron Maiden's rented 747 is also a head-turning marketing vehicle for the band itself. Its name runs down the forward length of the fuselage and the cover art for "Book of Souls," its sixteenth studio album, adorns the vertical stabilizer. "It's a little bit of a flying billboard going on here," Dickinson said. While it's nothing new for rock bands to travel in their own planes, Iron Maiden made history by first getting its entire show—lights, sound, instruments, and personnel—into a single jet. The band leased a 757 for its world tours in 2008, 2009 and 2011. The 747, however, is a considerable upgrade. "[President] Obama has Air Force One," Dickinson said during a recent press conference. "But our airplane is newer."